A high availability system architecture is designed for mission critical business processes which are expected to be available 24/7/365. •A database cluster (for failover capabilities at the database server). •A Bizagi cluster (to support load balancing and scalability). 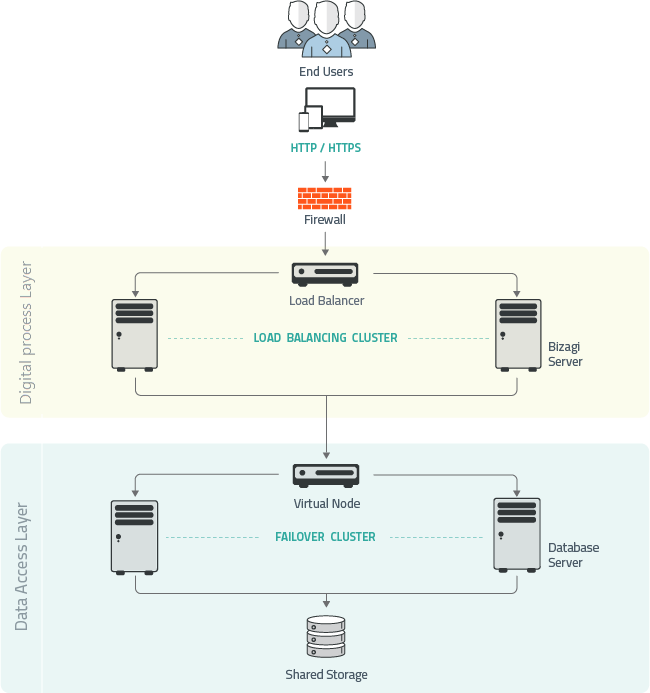 •A load balancer, in order to provide load balancing for the Bizagi cluster. Whenever end users need to work on the processes via internet from any device, and Bizagi is set up on-premises strictly within the intranet, consider using a reverse proxy server. This optional reverse proxy server, is set in the DMZ and avoids the need to publish the Bizagi server and its IP address. For a high availability solution, this setup considers a using two nodes in a cluster hosting the reverse proxy (to avoid single points of failure in your system architecture). For a high availability system architecture, at least two nodes for the database are recommended. •It is strongly recommended to consider the most RAM you can use to provide the best performance. •Two disks in RAID 1 (optional, recommended). •Each disk having 80 GB minimum. •It is strongly recommended to use high-speed disk drives. •Two NIC - Dual port 1GB. •Redundant Power Supply (optional, recommended). For a high availability system architecture, at least two nodes for a Bizagi cluster are recommended. •Each disk having 10 GB minimum. These operating systems should have the latest Service Pack installed. 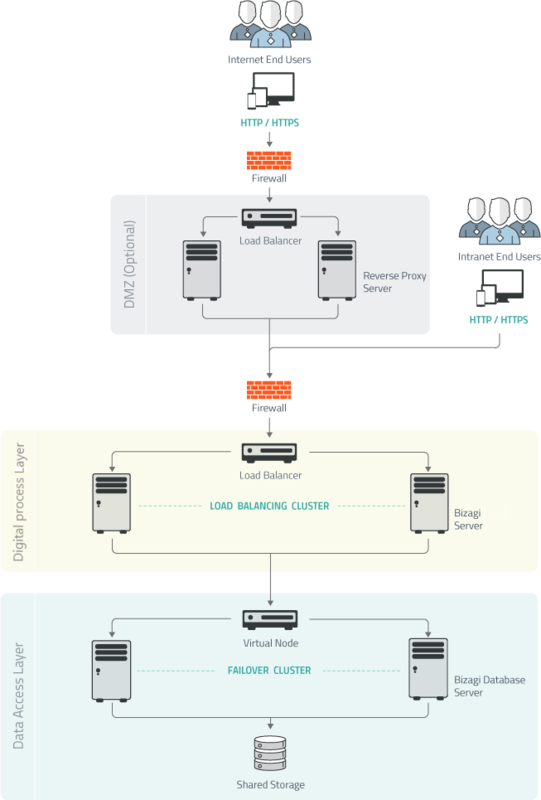 For the load balancing for Bizagi servers, you may use either a software or hardware load balancer. Bizagi does not provide the load balancer. It is recommended the use of a hardware-appliance load balancer such as f5. Files and documents uploaded through your processes, are not stored in the database. You may choose to integrate your corporate ECM/DMS system as a documents repository that store such files and documents; or alternatively, you may rely on a file server (i.e., a shared network drive). Bizagi does not provide the file server or ECM/DMS system. It is important that all nodes of your Bizagi server cluster have access to such file server. Such file server needs no specific requirements, save having the sufficient hard disk capacity to store your documents and files. You will need to calculate and perform a sizing analysis based on the expected amount of files and their file size. In case you choose to set up a secure access to your processes via Internet, it is recommended to use two nodes for a reverse proxy server in a high availability system architecture (configuring a load balance cluster at this layer). Bizagi does not provide the reverse proxy server. Requisites to set an Apache HTTP Server instance can be reviewed at Apache HTTP project official's documentation according to the specific version and platform. Bizagi Work portal is a web-based application and therefore, end users only need a browser or Bizagi's app installed for mobile devices.